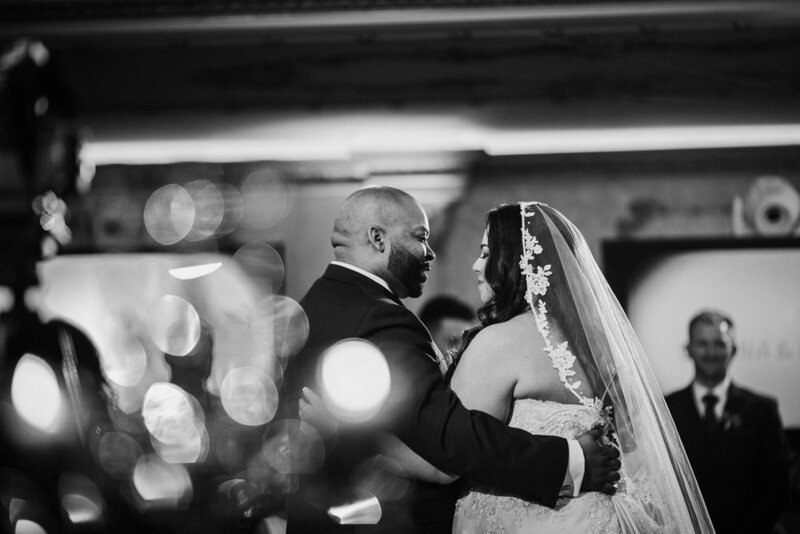 Beyonce, a Firetruck, and a whole lot of dancing can pretty much summarize Deanna and Darryl's Fall Brigalias Wedding! 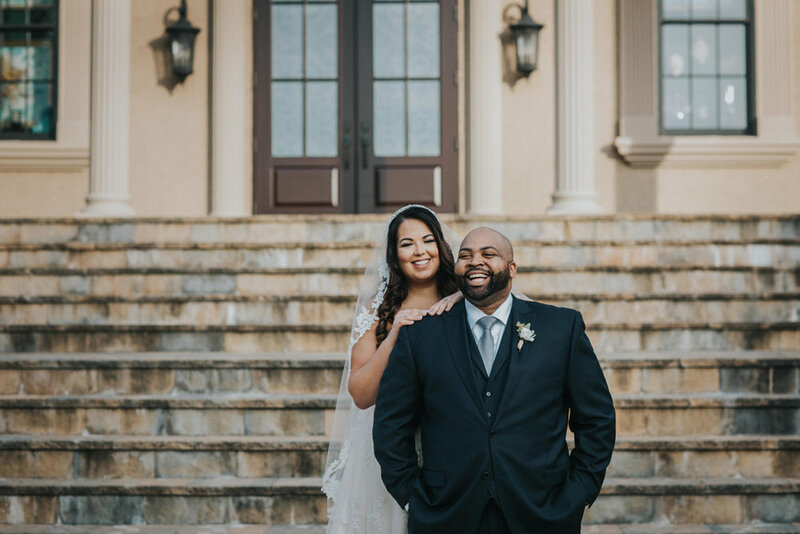 These two have a connection that puts anyone into a good mood, and a few hundred close family members and friends were lucky enough to be a part of their elegant wedding day. When I met Deanna and Darryl for their Batsto Village engagement session we started laughing like old friends do. 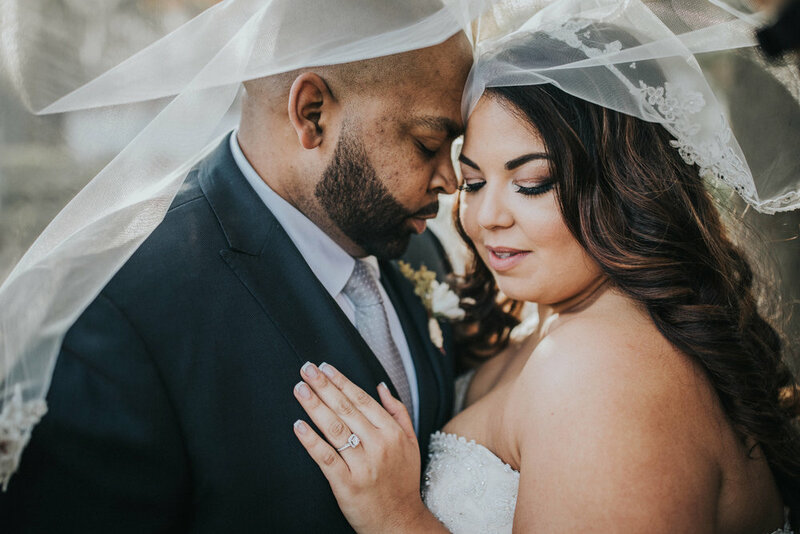 Darryl stepped out of his car, rolling his eyes at Deanna worrying about her hair and being nervous for the session despite him truthfully telling her she is the most gorgeous woman he had ever seen. Within minutes, the nerves went away and these two brought their model A-Game to their session. 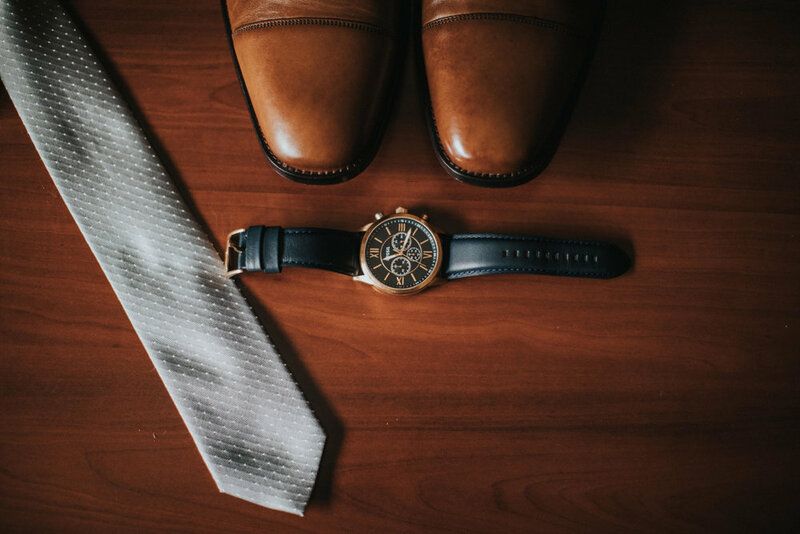 Luckily, on their wedding day they naturally leaned on their engagement session experience as they were at ease and had fun with the photography! 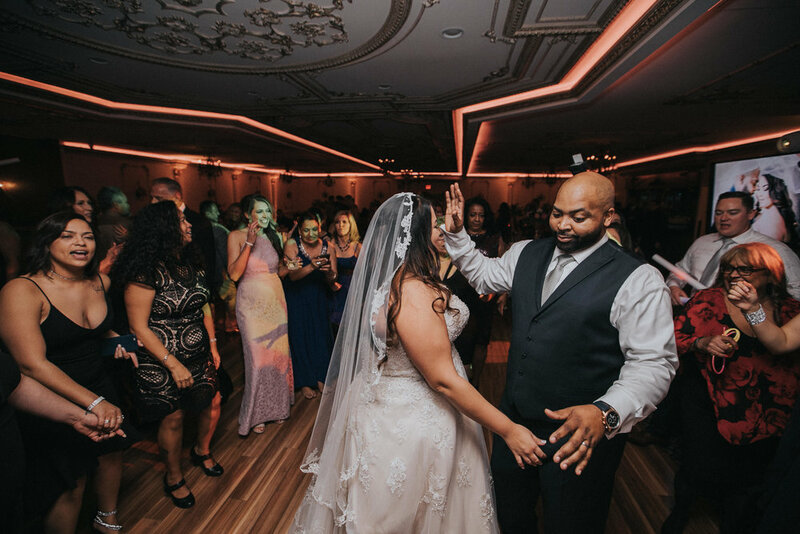 Deanna's bridal suite at the Courtyard by Marriott in Glassboro, NJ was buzzing with excitement. Each of the girls were being pampered by the hair and make up team, and Beyonce was on repeat (as I was warned she would be!). Deanna was all smiles as she sipped from her "best day" cup and enjoyed seeing everything come together. By the time she had to get into her gorgeous detailed gown, she came to realize that this was really happening! Darryl was prepping for the day at the same hotel. 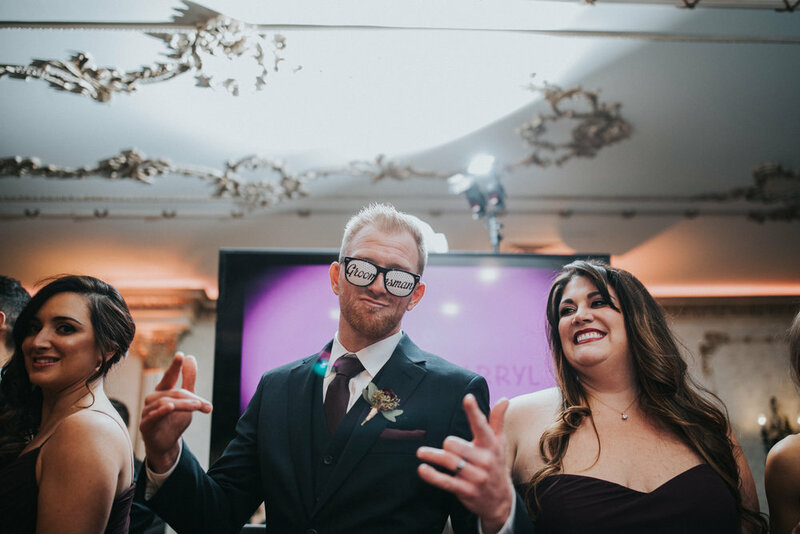 He was also enjoying the excitement in the air with his groomsmen and remained calm, cool and collected! Next, they were off for their first look at Brigalias! "Oh em Gee" was literally Darry's verbal reaction to seeing his bride for the first time! Body language says what we don't. His smile grew wider than it already naturally is and his arms stretched out towards Deanna instantly. There is was- the moment. He was floored by her beauty and she was completely smitten by his love! Leading up to this moment, I put Darryl into position and coordinated with my second photographer as well as the video team for our plan. I feel it is important to let this time naturally unfold with zero interference. 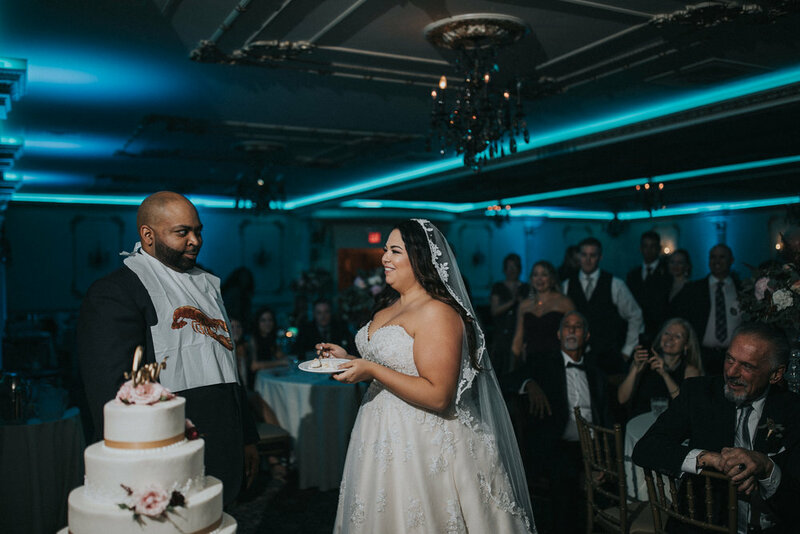 A first look is so special, and it is a moment a couple should enjoy until they realize although it feels like it, they actually aren't alone! 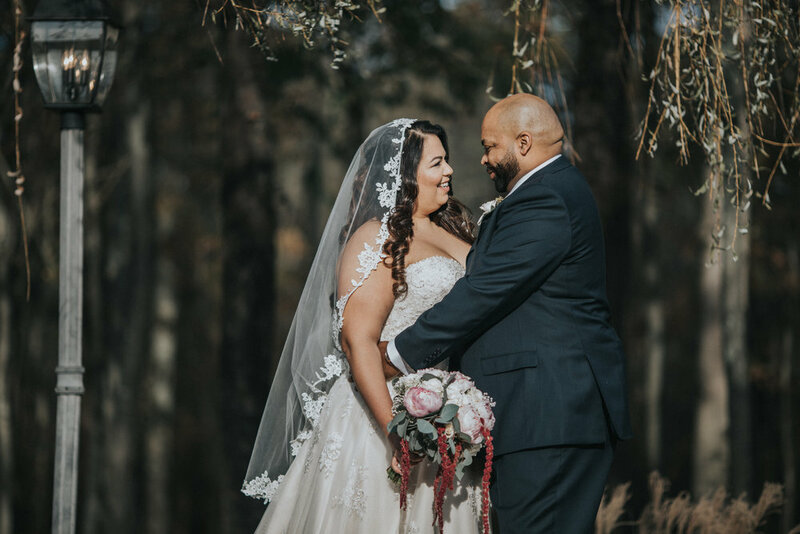 I'm so glad that is exactly how it unfolded for Deanna and Darryl as they truly were able to take one another in and enjoy time together before their ceremony! 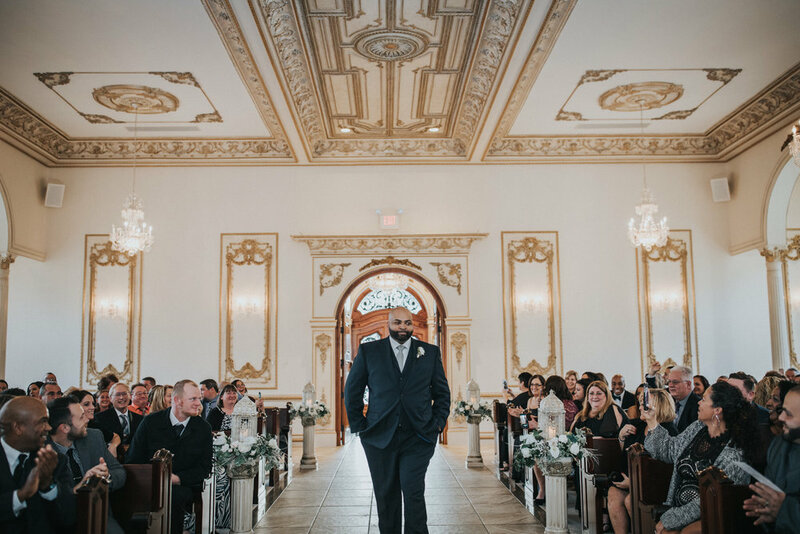 A thunderous applause and cheering welcomed Darryl into the Brigalias Chapel for their ceremony. It was like he was a celebrity! I thought to myself, wow imagine what reaction this gorgeous bride will receive as she takes her walk towards her soon-to-be husband. 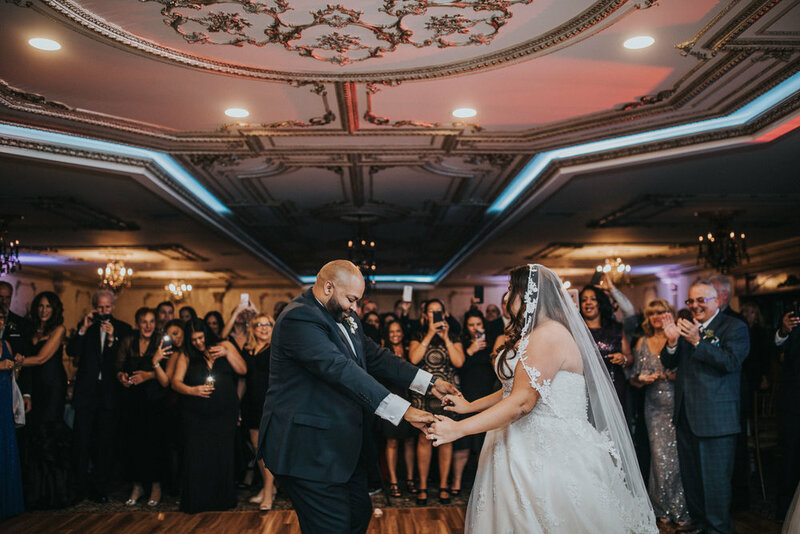 Once those regal double doors opened, and Deanna and her Father made their way to the altar I felt the room collectively gasp in the moment for her. 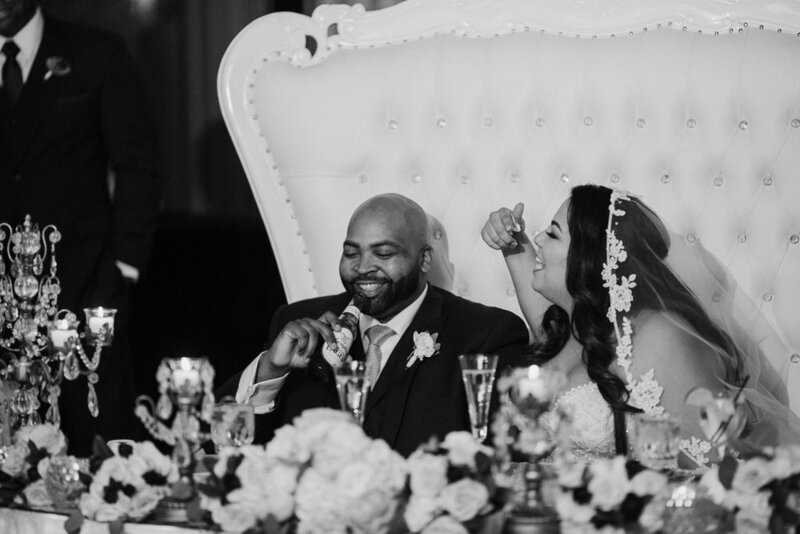 As they shared prayers and meaningful vows, their smiles were continuous. In marriage, no matter what life brings our way, if we can keep one another laughing we are on the right path! Something I don't notice as I am working during a wedding, but pick up on as I am editing is how strongly love can be felt through an image. This is why I decide to photograph weddings - for the way an image can make us feel. Often, I fall in love with my clients too because of how much they are in love with each other! On wedding days, I approach my photography in a storytelling way to showcase the love through the image. It is infectious. I do's, the kiss and the celebratory walk down the aisle together makes it official - they are now husband and wife! Time to Party! Darryl is a firefighter with Buena Fire Department. One of their firetrucks was brought in for the bridal party to use for photos. I had only been in a firetruck once before - wow that driver seat is really high! Their crew was so fun and supportive. I could tell the friendships ran strong as everyone was fully invested in these two having the best day! 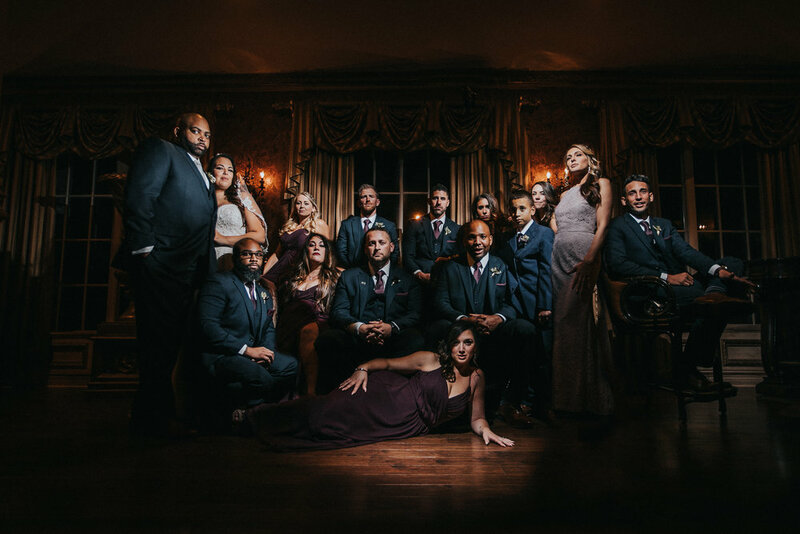 After bridal party and family photos, we made sure that Deanna and Darryl slowed down and enjoyed a few intimate, romantic moments together for their photos. 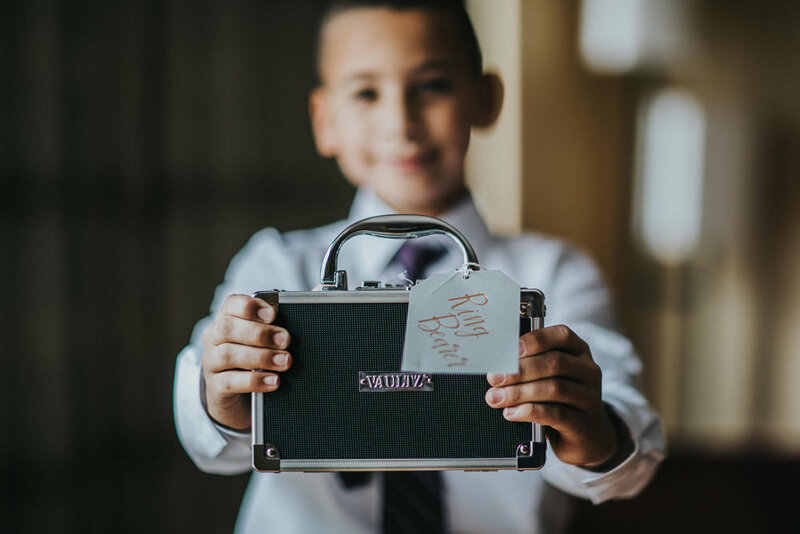 The time set aside on a wedding day for bride and groom portraits is really special. I love getting a closer inside look to their relationship, and to see what makes them laugh as well as what brings out that look of love in their eyes. Without fail, it is always how the other is looking at them! Using the grounds at Brigalias is always fun, as you can turn to your right and create an entirely different portrait from what is on your left! Their reception was a continuous party! The entertainment team from WeddingSetGo made sure the dance floor was busy all night. They displayed the same-day-slideshow that I prepared for Deanna and Darryl on their large television screens for everyone to enjoy! The toasts (or, roasts) were captivating and the special parent dances brought out the feels! Brigalias never disappoints with their decor and culinary. Staying until dessert is served as they parade the guests into the dessert room is a must! Congratulations again Mr. and Mrs. Mapp! I wish you many happy years ahead full of laughter! Thank you for having me as your photographer.